Want an ability to just throw a fireball straight ahead? Learn how to do it in this gameplay tutorial. 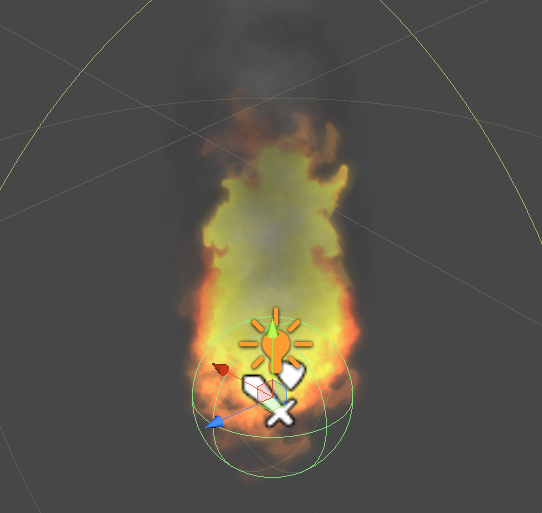 We’ll create an ability that throws a fireball into the direction the player is currently looking. The fireball will damage enemies when it hits them – this is done using Damage Dealers and Damage Zones. You can find more information on them in this how-to and this game tutorial. This is only an example, if you have your own assets you want to use, go ahead and use them. Keep in mind that some settings might differ depending on what kind of prefab you want to create. I’ll use the Fireball prefab already added to the tutorial assets and add the needed components. Since we’re using Damage Dealers and Damage Zones to do damage, we’ll need a collider, a rigidbody and a damage dealer component on the fireball prefab. Add a Sphere Collider component and change the following settings. If you want to do damage on collision, disable it – I’ll go with Trigger Enter damage. Add a Rigidbody component and change the following settings. Add a Damage Dealer component and change the following settings. This way, the fireball will do damage to every target it hits. If you want to only do damage to one target, enable this setting. Click on Add Tag to add an activation tag (which we’ll use in the battle event to activate the damage dealer). And that’s it for the prefab – either save it as a new prefab by dragging it from the scene hierarchy into the project view, or apply the changes to the prefab (if an already existing prefab is used). Open the ORK Framework editor and navigate to Events. Click on New Battle Event to create a new battle event. This event will spawn our prefab, activate it’s damage dealer and send it flying. First, we’ll need to set up the prefabs and audio clips we’ll use. Click on Add Prefab to add the prefab. Select Fireball, the prefab we just created. Click on Add Audio Clip. This audio clip will be played when we shoot the fireball. Click on Add Audio Clip again to add another clip. This audio clip will be played by the damage dealer when it hit a target. We’ll use this step to play the fire audio clip on the user – we could also play an audio clip in the Spawn Prefab step, but that would play the clip on the spawned prefab instead. Set to X=0, Y=1, Z=0. For the damge dealer to actually do damage to anything, we need to activate it first. Since the auto activation only works for damage dealers parented to the user of an action, we’ll need to manually activate the damage dealer of the spawned prefab. Click on Add Tag to add a tag. This will activate the damage dealers with the matching tag. This will play the 2nd audio clip when a target was hit. Now it’s time to move the fireball forward. Set to X=0, Y=0, Z=1. This will send the fireball forward. Disable this setting, since we don’t have a character controller attached. We don’t want the fireball to stay in the scene forever, so we’ll destroy it after some time. This can also be set up in the damage dealer’s settings, but it’s better to handle this in the event, otherwise you’d have to change things in two places when you want to change the time the fireball flies around. To prevent the player from spamming the ability, we’ll add a little wait time. And that’s it for the battle event – click on Save Event and save it as fireball.asset in Assets/Events/Battle/. Navigate to Status > Abilities and create a new ability. Change the following settings. Since we just throw the fireball straight ahead, we don’t need to select a target – this is done by setting the Target Range to None. Change the already added Battle Event settings. Select the fireball event we just created. Enable the battle system types you want it to be used in. Click on Add Value Change to add a new status value change – this is a magic spell, so we want to consume MP. The fireball ability will now consume 5 MP when used. Click on Add Value Change to add the status value change for the damage to the target. Enable Element and select Fire. Enable Attack Type and select Explosion. And that’s it for the ability. If you want to use the fireball ability, you’ll need to add it to your player’s combatant. Navigate to Combatants > Combatants and select your player combatant – in my case, that’s Brown Pants. Alternatively, you can also add the abiltiy to the combatant’s class or an equipment, or learn it through the event system or items. Click on Add Ability to add a new ability to the combatant. If you like to learn the abiltiy at a different level, set it to something else – for testing purposes, level 1 will do. 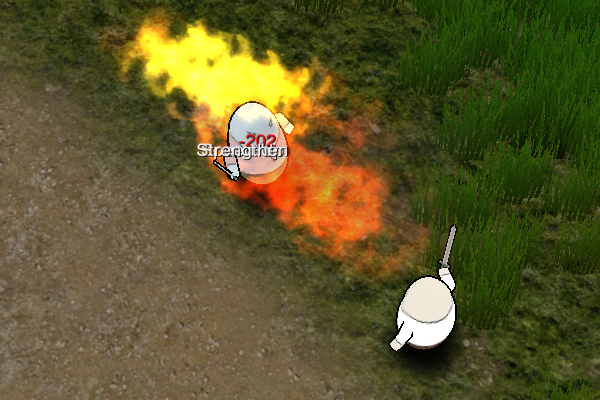 When testing your game, you’ll now be able to throw fireballs around. Using the fireball ability through the battle menu is boring, so why don’t you set up a Control Map to instantly cast it using an Input Key? Add a new Input Key in Base/Control > Input Keys and set it up how you need it. Add a new Control Map, or add a Control Key to an already existing control map in Base/Control > Control Maps. To use the fireball ability with a control map, use the following Action Settings. A more detailed descriptions of using control maps can be found in this game tutorial. You can use Battle Events to do more complex animations when a damage dealer hits a target. To use this functionality, you need to enable the Animate setting in the ability’s Damage Dealer Settings. Now you can add battle events like we already did to animate the ability – the battle events will be used when the damage dealer hits a target. Keep in mind that an animated damage dealer wont automatically calculate the damage, so you’ll need to use a Calculate step in the battle events of the damage dealer.